The environmentally-friendly, people-friendly, 100% aqueous answer to high-performance parts washing for New Zealand workplaces. The Ecosafe washer cleans greasy, dirty parts within seconds – all using a safe, water-based solution that keeps your workplace and your people safe and healthy. Your workshop, garage or industrial space probably sees a ton of solvents, oils, greases and other chemicals from machinery and parts. Inevitably, these spread throughout work areas, negatively affecting the environment, the safety of your workplace and, most significantly, your staff’s health. The Ecosafe Washer is your safe, environmentally-friendly solution to parts cleaning. 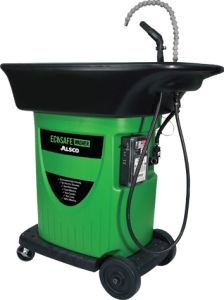 Using a powerful, 100% aqueous solution, the Ecosafe blasts oils, greases and dirt from your workplaces mechanical parts, including motor engines, brakes, and more. Electrically-powered, it’ll leave your most important parts sparkling clean – at no cost to your workplace or your staffs’ health. Alsco are pretty certain you’ll like the Ecosafe Washer parts cleaner. That’s why we’ll bring one of our units right to your workplace and show you how straightforward cleaning parts is with the Ecosafe. We’ll even leave the washer for you to use for up to one week – for free. Aren’t happy with it by the end? Don’t worry – you’re under no obligations to pay anything. We’ll simply pick it up and be on our way. Zero risk or effort needed on your part. That’s how confident we are that you’ll love the Ecosafe Washer parts cleaner. Contact Alsco today to set up your free demo and week-long trial! Affordable – Where most Ecosafe Washers can run up to $3000, Alsco will rent yours from a few dollars a day, cleaning, fixing and replacing your washers along the way – at no added cost! 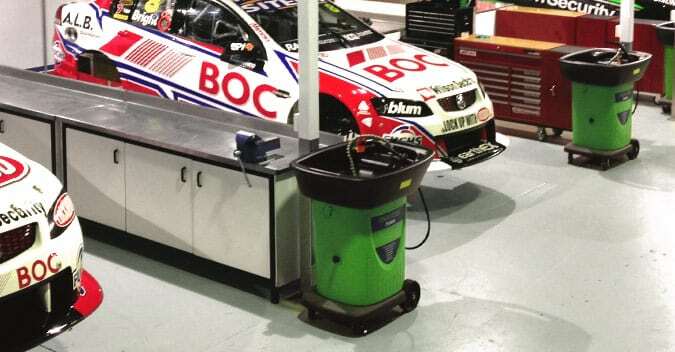 There’s a reason dozens of New Zealand workshops, garages and mechanics are choosing our Ecosafe Washers. As safety and environmental awareness become more and more important, performance requirements stay the same. The Ecosafe perfectly balances cleaning effectiveness with safety. Small and portable, it’s an excellent, agile answer to parts cleaning in your workplace – no matter how small or confined. Workshops and garages in New Zealand can be dangerous places to work. You don’t need the added stress of chemical/solvent hazards in your workplace that may cause serious skin and respiratory health issues among your employees. The Ecosafe – using a water-based solution – is non-toxic, non-flammable, and keeps your employees safe, your workplace clean, and the environment green. A sophisticated process of bio-remediation breaks down oils and greases into two, 100% safe by-products – water and carbon dioxide. 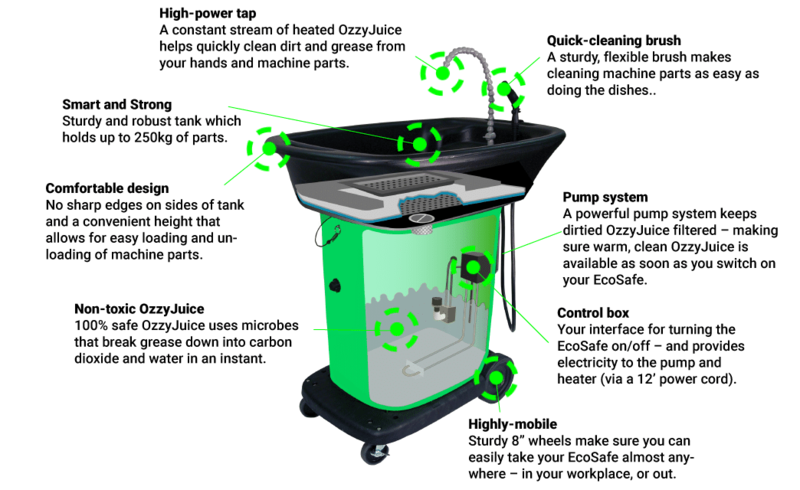 The heated, water-based solution of the Ecosafe can be used to clean dirt, grease, oils, and other common chemicals found in your workplace – and can even be used by staff to clean their hands after hours at work. How appealing is dropping $1000-3000 on a piece of cleaning machinery? For most New Zealand businesses, not very. The reality is that’s what most parts washers cost. With Alsco, we charge you an affordable, annual fee that works out at a few dollars each day. Along with this, we don’t just supply your Ecosafe Washer. We check and maintain each unit regularly. Need a replacement? Don’t worry – Alsco will happily help at no added cost to you. Interested? Claim Your Free Demo! Alsco will happily demonstrate the Ecosafe Washer right in your workplace. Simply get in touch with our local New Zealand team, and we’ll arrange a date suitable for your schedule. We’re almost certain you’ll be convinced. On the off chance that you’re not interested, however, you’re not obligated to pay or purchase anything. The demo is 100% free – no strings attached. Use the contact form to the right to learn more or to claim your free demo today!